USS George Washington (CVN-73). Photo courtesy U.S. Navy. Congress wants the Navy to keep 11 aircraft carriers in its fleet. The Navy wants to keep 11. Law dictates that the Navy keep 11. And yet, the Navy’s budget plans–assuming that sequestration remains the law of the land–does not include funding to refuel the USS George Washington (CVN-73), instead defueling and inactivating the flattop. Navy officials have said for weeks it would take an additional $7 billion across the Future Years Defense Program (FYDP), from fiscal year 2015 to 2019, to conduct the refueling and complex overhaul (RCOH) and keep the carrier in the fleet. They would rather keep the ship, they said, and would change their budget plans if Congress indicated they would unshackle the Defense Department from sequestration in FY ‘16. They say they’ll decide next year whether to defuel or refuel based on signs from Congress. But as lawmakers, industry officials and even some admirals have admitted, the truth is much more complicated. USS George Washington (CVN 73) transits Tokyo Bay to its forward operating location of Yokosuka, Japan, after completing its 2012 patrol. Photo courtesy U.S. Navy. Several congressmen have said they fully expect the carrier refueling to find a place in the budget, though none could say how they would accomplish that feat. But the will appears to be there. 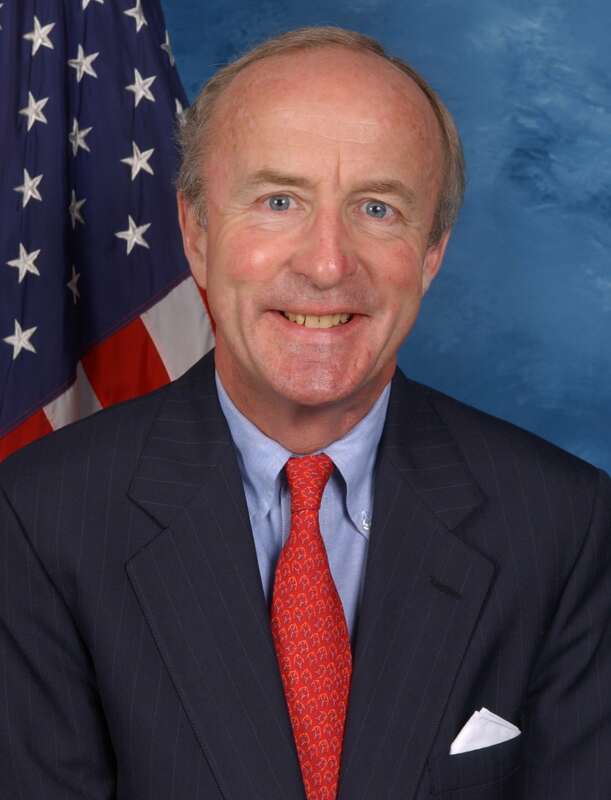 What Frelinghuysen promised, despite the unknowns about how to pay for the RCOH, was that he wouldn’t postpone the decision the way the Navy proposed doing. “The discussions are ongoing, I don’t think we’re going to wait until next year to settle this matter,” he said. Asked the same question, Forbes responded that he and his HASC subcommittee have not gone through the budget request line-by-line to look for potential cuts, but he didn’t rule out that possibility. “I feel pretty comfortable we’ll get it back in. I can’t tell you all the pots we’ll take from…but I think that will be a debate we’ll have both privately and probably publicly before all this shakes out,” he said. For the Navy’s part, the will is there too. 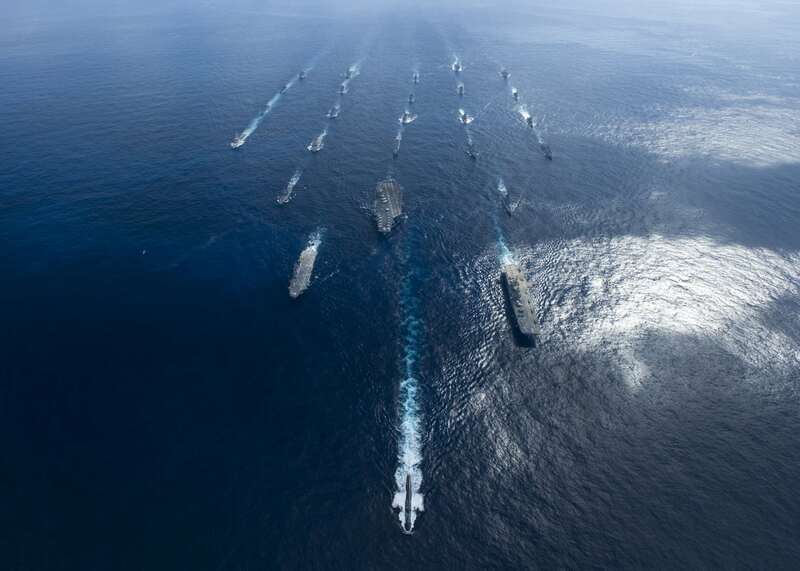 During a March 26 hearing with Forbes’ subcommittee, Vice Adm. Joseph Mulloy, deputy chief of naval operations for integration of capabilities and resources, described the Navy’s extensive effort to keep its carrier fleet intact amid the threat of continued sequestration. “If you remember last summer, DoD could not believe that we could not cut two or three carriers. The Navy, through a tremendous effort led by [Navy acquisition chief Sean] Stackley…freed up money in the Navy budget to be able to reduce that number down,” he said. A little more time to continue looking at the budget, as well as assurances the Navy will see at least some sequester relief in FY ’16, would seal the deal on keeping George Washington around, he said. The $7 billion price tag to keep the George Washington masks the complexity of the situation. A breakdown of the bill shows a lot of unknowns, as well as a lot of items that would affect other line items in the budget. In the current spending plan, laid out in the president’s budget request last month, the Navy would spend $2.4 billion from FY ’15 to ’19 to bring the George Washington back from its homeport in Japan to the Huntington Ingalls Industries [HII] yard in Virginia and then defuel and inactivate it. To keep the ship would cost $7.046 billion above that–for a $9.446 billion bill over the FYDP, a Navy official told Defense Daily. The current budget plan assumes the carrier would be inactivated and its associated air wing would be shut down–and therefore the Navy would need fewer aircraft. The plan includes a $250 million placeholder line to account for terminating the multiyear procurement contract with Sikorsky [UTX] for MH-60R helicopters. The Navy had planned to buy 16 in FY ’16, 11 of which would go to multiple air wings and five of which would serve as spares. The exact cost of terminating the contract a year early is unclear, as many of the termination fees and production line shutdown costs are negotiated between the contractor and the military customer when a termination decision is made, the Navy official explained. If the Navy were to keep the George Washington and its air wing, the service would have to find an additional $1.474 billion for the air wing, the official said, to account for purchasing the 16 MH-60Rs and paying for the personnel and operations and maintenance of the air wing. The Navy official stressed the plan laid out in the budget is completely reversible–the FY ’15 budget request fully funds the MH-60R contract, including advance procurement for the ’16 helicopters, and the Navy would want to finish out the multiyear deal if Congress provided the funding to maintain the aircraft carrier and its air wing. The current funding plan includes manpower funding that tapers down as the years go on–the thinking being that as the ship progresses with its inactivation, fewer sailors would be assigned to the ship. The budget request calls for full personnel funding in FY ’15 at $323.7 million, then dropping to $198.5 million in ’16, $165.5 million in ‘17, $90.7 million in ’18 and $33 million in ’19, the official said. But the personnel costs somewhat muddle the true cost delta between refueling and defueling the ship. If the Navy changed course and opted to refuel the ship, it would need almost full manning levels each year, which about doubles the bill for personnel alone across the FYDP. The Navy also calculated it would need $125.7 million in additional shipyard operations and maintenance dollars to account for more sailors and their families being at Naval Station Norfolk. However, the Navy official said “in no uncertain terms” that the service would not push sailors out of the Navy if the carrier were inactivated. Instead, those personnel would be put into empty billets elsewhere–so those manpower and base operations costs aren’t true cost savings, they would just be pushed into other accounts within the Navy budget. Finally, if the Navy refueled the George Washington, the bulk of the cost would be the refueling itself. The Navy lists this as a $4.393 billion cost for the refueling, plus a few additional associated costs that lift the total to $5.077 billion to refuel and modernize the aircraft carrier. To stay on schedule, the Navy would have needed about $800 million in FY ’15.The Navy official said that sum is not a drop in the bucket, but the service could have found those dollars. However, unsure whether Congress would grant additional sequestration relief and allow the Navy to squeeze the other $6.2 billion into the FYDP, the official said it would be irresponsible to spend so much money planning and buying materials only to have to cancel the refueling next year if sequester relief is not granted. By all accounts, yes. Those in the aircraft carrier business have said the United States has 11 carriers in a 15-carrier world. Dropping down to 10 would jeopardize today’s “2.0” carrier presence, with one in the Pacific and one in the Arabian Gulf at all times. Gortney, who ensures all the East Coast ships are properly manned, maintained and ready to deploy on time, said at a March 27 breakfast that the aircraft carrier fleet is already strained–he just sent the USS George H.W. 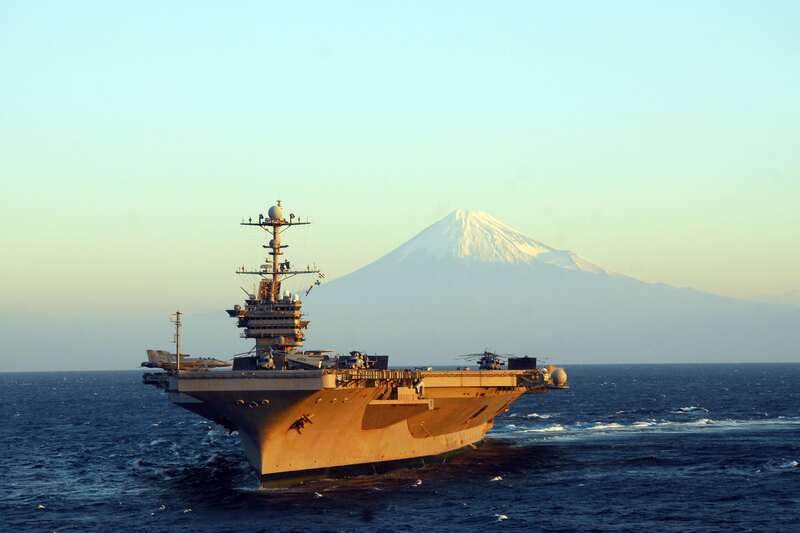 Bush (CVN-77) out on a scheduled 9-and-a-half-month deployment. “Ladies and gentlemen, that is not a sustainable model–sailors won’t do that, sailors and their families won’t do that, but it’s the only way we can make it,” he said. As he revamps the Fleet Readiness Plans for each type of ship, he hopes to get the carrier strike groups to a 36-month cycle that includes just one 8-month deployment. When is a decision needed? Defense Secretary Chuck Hagel and Navy Secretary Ray Mabus have said repeatedly that the decision on the aircraft carrier’s fate has been postponed until next year–they have not decided to inactivate the ship, even though that’s the course of action reflected in the budget documents. Mabus even told the Senate Armed Services Committee on March 27 that he could wait until the FY ’16 budget process in Congress–a full year from now–before he needed a signal from Congress on whether lawmakers might be willing to provide sequestration relief to let the Navy keep its aircraft carrier. 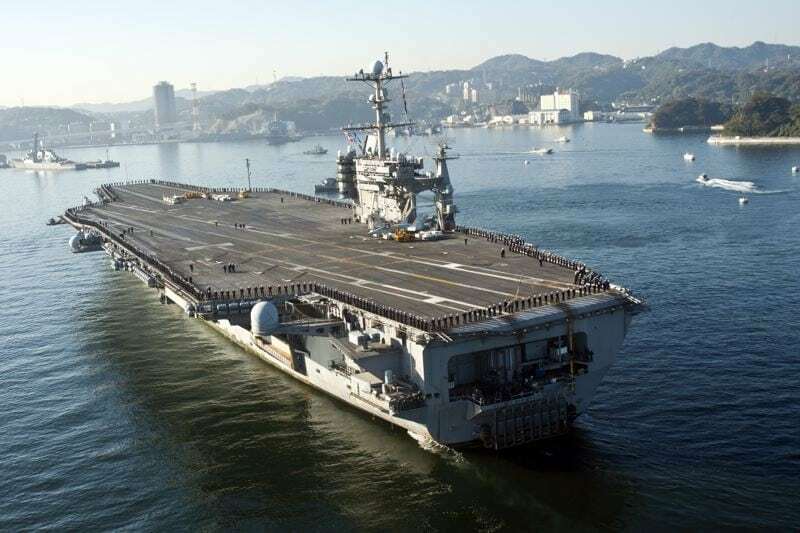 But Sen. Tim Kaine (D-Va.) suggested the signal should come now, and HII Vice President for In-Service Aircraft Carrier Programs Chris Miner said the shipyard really ought to start some of its planning now. Miner pointed out that the Navy has little experience inactivating aircraft carriers: the USS Enterprise (CVN-65) is the only one thus far, but that ship had a different design than the current Nimitz-class carriers and therefore used plans that wouldn’t apply to George Washington. The Nimitz won’t retire until 2025, so no plans exist yet. Miner said the Enterprise defueling and inactivation took three years to plan, so the Navy would need to begin planning soon for an inactivation to avoid disrupting the drydock schedule at the yard. “We really do need to get the decision to the point where they put money in FY ‘15 for planning,” he said, stressing that the company obviously hoped the Navy would decide to keep the carrier in the fleet. The Navy has $245 million in FY ’14 money that it has not yet spent on the RCOH planning effort. Navy acquisition chief Stackley said at the March 26 HASC hearing that the service would release $63 million for planning the defueling section alone–not for ship modernization or refueling plans–but cautioned against that logic, saying “a defueling for a refueling does not equate exactly to an inactivation,” so from the company’s perspective they need the whole sum of money to begin planning for work on the ship in its entirety.